Being the Hydraulic Engineering student association, we are considered to create and maintain the link between students, professors, hydraulic companies and ourselves. We do so by keeping everyone updated by sending newsletters and magazines, organizing field trips, case studies, guest lectures and other activities like Master Communities. Also, we will be the central contacting point for students and others to ask questions, to gather information about activities or to get a nice hydraulic chat. 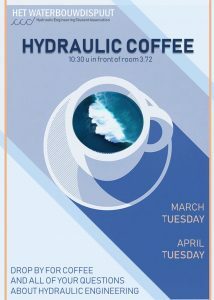 For this purpose, we organize a weekly coffee break for all Hydraulic Engineering students and the whole Hydraulic Engineering department. It is a very casual and regular event. We’ll make sure there is enough coffee and tea for everyone, and knowing there will be delicious cookies as well, you know you should be there! The schedule for the Hydraulic Coffee is presented below and will always start at 10.30 AM in front of our office, room 3.72. 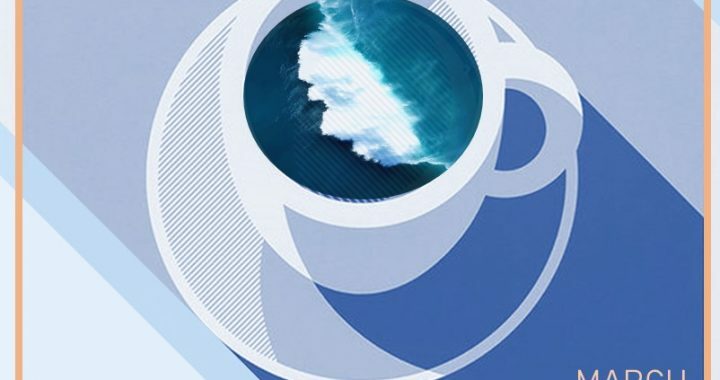 Every last Coffee of the month will be hosted at the Waterlab. Check also our Facebook or ask someone of the board. It might be your chance to register yourself for upcoming activities or ask that question you wanted to ask your professors! Geplaatst in Upcoming events en getagd met Date: Tuesdays in April, Location: 3.72 at CiTG, Time: 10:30.